Go to any networking event, meet up, or Chamber luncheon and mention that you’re starting a business. You’re likely to get a cacophony of brand advice along the lines of: get a logo, get a great tagline, get a website … and don’t forget business cards! And they’re right: you do need a brand, a way to identify you and your business that helps you stand out from your competition and reach your ideal clients. Unless you’re very talented, you’re probably going to hire a graphic designer to assist in your quest for these branding essentials. Same holds true if you’re going through a re-brand, or need help with a new marketing campaign—you may be hiring a designer. Whether you use a big agency in your city, a freelancer from a service like UpWork, or a competition site like 99 Designs, all graphic designers have one thing in common: they speak Design. To a non-designer, Design does indeed sound like a foreign language. Just like you’d bone up on a few phrases before heading off to a foreign land, it’s good to know some of the words and phrases that will be in your contract, questionnaire, or emails with your designer. Below you’ll find a handy glossary of common design terms, to help translate Design into layperson’s words. If your head starts spinning reading through these, just move on to the next section and bookmark this page so you know where to look up an unfamiliar term. 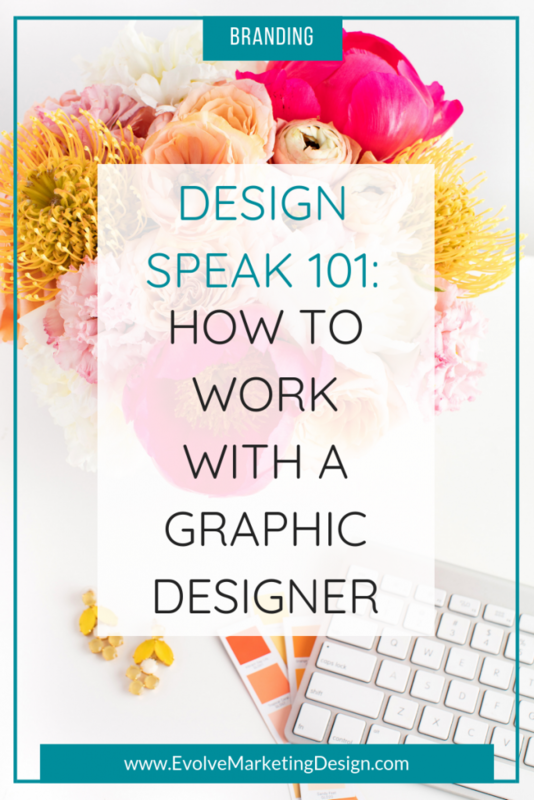 Next, I’ve also included some tips to communicate with your designer, so you’re both on the same page and you get exactly what you have in mind. Finally, I’ve got a free checklist of details to get from your designer to support your branding and marketing efforts long after you’ve sent your final payment to the designer. Alignment: The position of lines of text or an image, for example, left, right or centered. You may know this concept as justification in word processing. Bleed: Extending a graphic element off the edge of a document, so that when it’s trimmed there is no white line or space along the edges. In layperson’s terms, it’s when a photo goes all the way to the edge of a book cover, for example. There’s no “margin” around it. Border: A decorative line or design that forms the boundary of area of text or an image. Like a frame around something. Drop Shadow: A visual effect that gives the impression of an image or text is raised above the background. The font, aka typeface, that you use in your logo, your website and your marketing materials relates to the readability of your message. Fonts can also convey nuance and tone. What that means is, you wouldn’t use balloon letters on an annual report, just as you wouldn’t use Old English script on a 5-year old’s birthday invitation. Fonts are broken down into four main categories. Serif: A serif is a small, decorative stroke at the end of horizontal and vertical lines of a letter. Times New Roman is a serif font. Serif fonts are considered professional, authoritative and traditional in their appearance. Script: A type of font that mimics cursive handwriting, ranging from simple to swirly and embellished. They appear elegant, personal and/or more causal depending on the font. San Serif: “Sans” means “without” in French, so a sans serif font is one that is without serifs. Examples include Arial and Helvetica. San serif fonts tend to feel modern, stylish and cleaner than the other types of fonts. Slab Serif: This is like a beefier version of a serif font. The serifs are thicker and chunkier; they’re used in headlines and announcements. Poster Bodoni is a slab serif. Since color has physical, mental and emotional effects on us as humans, it’s one of the most important aspects of any design. Color itself is a marvelous and complex thing that I can talk about for hours. Technically, color is light, broken up into specific wavelengths that we can see. (Remember your science teacher showing you how a prism refracts light into a rainbow?) Each a color has a specific wavelength, and objects either reflect or absorb these wavelengths in such a way that our eye sees a particular color. Hue: This is the general name or color family. What we generally call a color is technically referred to as a hue. Red, yellow, purple – these are all hues. Shade: Adding black to a hue to make a darker color. Burgundy is a shade of red. Tint: Adding white to a hue to make it lighter. Pink is a tint of red. RGB: Acronym stands for “Red, Green, Blue” and is a way to define a particular color in terms of the mix of red, green and blue in that color. A large percentage of the visual spectrum can be defined in this way. The magenta in my logo has an RGB mix of 130, 26, 88. Hex Code: Defines a specific color using a hexadecimal system. The code (it always starts with a pound sign #) is 6 hex values or 3 pairs of hex values that represent the level of each component color. It looks like gobbledygook (#821A58 is the magenta color in my logo) but if you use an online graphics tool like PicMonkey or Canva, you will need the hex code for your brand colors. PMS: Pantone Matching System. A proprietary method of defining color created by the Pantone company, primarily used in commercial printing. These abbreviations will show up as the file extension—filename.png, for example—on the files you may receive from your designer. AI: Adobe Illustrator file. This is a powerful graphic design program that many designers use. Getting the work file will allow you (or a future designer) to edit the actual file. GIF: Graphics Interchange Format. A way to compress an image, with a twist. A GIF allows you to store multiple images in one file, so it can be animated and appear to move. In today’s parlance, a GIF is most assuredly animated. It’s a never-ending loop. You’ve probably seen an animated meme on Facebook—that’s a GIF. PSD: Adobe Photoshop file. This is another popular program for creating graphics. PDF: Portable Document Format. A file format, invented by Adobe, that’s used to present and exchange documents reliably while being independent of software, hardware, or operating system. All you need is a PDF reader like Adobe Acrobat to open and see the document. JPEG: Joint Photographic Electronic Group. An image file that uses a common process for compressing digital images. It’s great for documents that will be printed. PNG: Portable Network Graphics format. A very popular image format for the web, it’s one of the most versatile because it allows you to have a transparent background. It compresses well, meaning that although the file size can be small, the photos have a crisp, non-pixelated look online. Now that you know a few key design terms, let’s put them to good use! 1. Refer to the logo concepts by number. The designer will likely number the logos for ease of reference. Instead of saying, “The top one is a little dark …” say, “Number 1 is a little dark.” Using the number instead of some other subjective reference will help you and the designer stay on track. 2. Say what you like first. Graphic designers usually aren’t married to their concepts and genuinely want your input and guidance; they want to deliver the best design that exceeds your expectations. Still, it’s nice to start with something positive. Maybe you like the color, or the font, or the swooshie-do (a technical term to be sure) at the end of the tagline. Whatever strikes your fancy about it. Of course, if the design is not at all what you want and is ugly, don’t invent something nice to say about it. Be honest. If your designer got enough input from you at the outset this shouldn’t be a problem, though. 3. It’s OK to sit with it for a day. Acknowledge the designer’s requested turnaround time, but sleep on it if you have to. I know I’ve had designs presented to me that looked awesome! Amazing! I can’t believe it! At first. And then, once I sat with it for a minute and the honeymoon effect wore off, I could see the details missing, the things that needed tweaking. If you’re still excited about a design after a few hours or a day, so much the better! 4. Give constructive feedback. Be honest about what you don’t like. If you don’t know the design term for something that’s bugging you, express it as a feeling or a mood. You could say, “the top part of #2 feels heavy” or “it feels too dark for the vibe I want.” Trust your gut. This is your brand, and you know intrinsically how you want your potential clients to feel when they see your logo and branding. If you’re not feeling it, neither will they. 5. Give direction. Perhaps you like the color in #1, but the font in #2, and the icon in #3. Say so! Your designer may ask you to further expound on one of your points, and it’s great to have that back and forth. Your input will spark even more ideas for your designer! The clearer you are, the better they can deliver. Your designer has delivered the final version of your logo or project, and you’re more than pleased! You’re excited to get it out into the world! You make your final payment and that’s that. Right? Wrong. Here’s what happens: you get a great logo, maybe even a website and a snazzy cover for your opt-in. Great! You’re off to a great start. But then, a month later, you need a Facebook cover photo. Then you need a brochure, business cards for your new hire (congratulations!) and an ad for the church bulletin. Your design needs will continue and evolve, and you probably won’t want to be running back to that graphic designer each time you want to put a post on Facebook. If you don’t have simple yet vital information about your own logo and brand, you will be a bit hamstrung in terms of creating additional content and collateral that has a cohesive look and feel. Using the exact color blue from your logo or the exact font from your tagline all helps to create a singular, recognizable and aligned brand. This is the kind of information I ask my clients for all the time when we’re working on their social media or a press kit. Sometimes they know it, but many times, they don’t. And they should; it’s their business and their brand. I put together a checklist of essential design elements you’ll want to get from your designer when you sign off at the end of your project. This way, someone on your team or another designer will be able to match your brand elements perfectly. Trust me, you need this information from your designer! Click the graphic below for instant access. Give the checklist to your designer and ask her to complete all of the information. Then, keep it in your “Logo” or “Brand” file on your computer. If you have an operations manual or a style guide, print a copy and put it in there, too. In a future post, I’ll show you how to use these elements to create a Brand Board so your marketing is always in perfect alignment with your brand. Just a quick reminder: I’m currently booking branding strategy sessions. I call them Spark Sessions because, trust me, the sparks F-L-Y! It’s like brainstorming, only better. What can you get out of it? Well, one recent Spark Session participant said I gave her a “million dollar idea.” Could you use one or two of those? If so, let’s chat! Click to set up a complimentary phone consult and let’s see how I can help! Hey there! Before you go, if you enjoyed this article and know other people who might enjoy it as well, please share it on your favorite platform. Thank you!